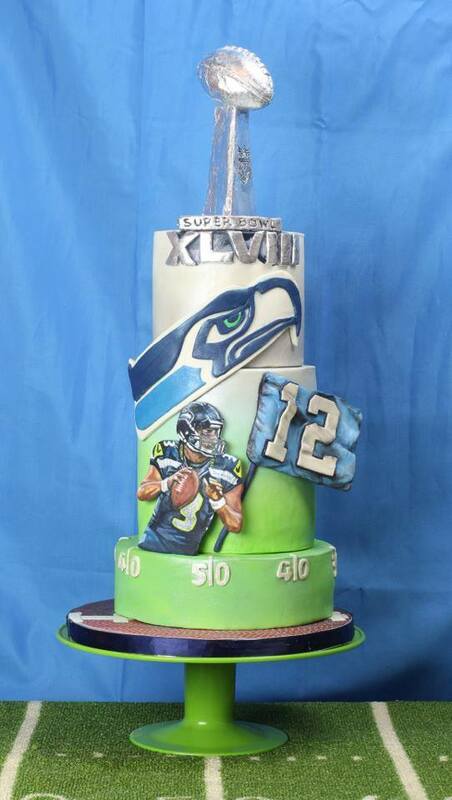 Kristen (KO-sCakes) is making a very tall, hand painted Seattle Seahawks cake to celebrate this Sunday’s Superbowl! 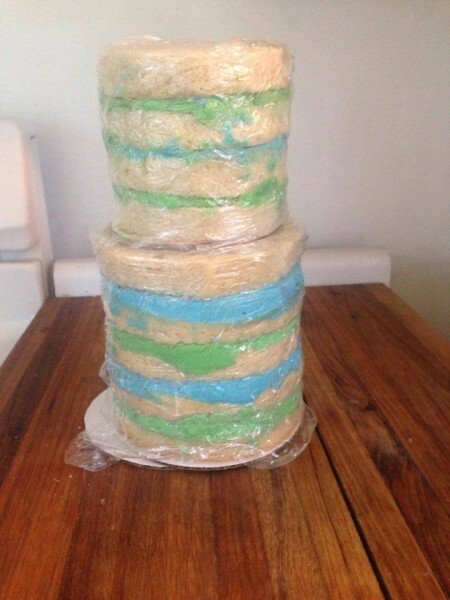 We wanted to share her in-progress photos of this amazing cake. 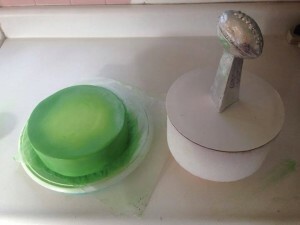 9 layers of cake with Seahawks colored buttercream ready for ganache!! I NEVER color my buttercream because I do fondant on the outside. But I thought it would be fun for this cake. [Painting my cakes is] one of my favorite things to do. 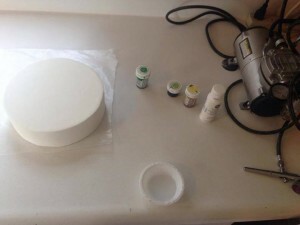 I try to make all my cake projects act and feel as much like “real art” as possible. Sugar paper is the closest thing to real paper, and I love it. I use modeling chocolate because it stays flexible, and I can bend it to fit the side or top of a cake. 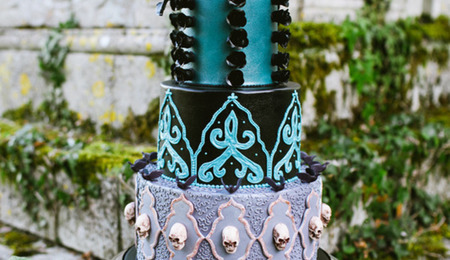 I would try to paint directly on the chocolate, but the fat content doesn’t allow that ( which I’m sure you know lol) so almost all of my painted pieces on my cakes are exactly like this one. 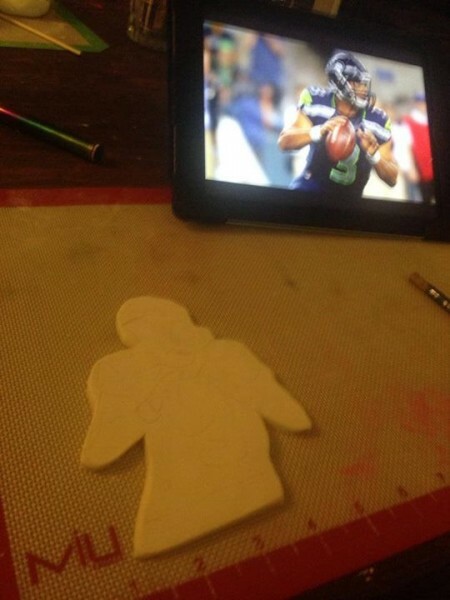 Here is a hand painted Russell Wilson, on thin rolled out modeling chocolate. 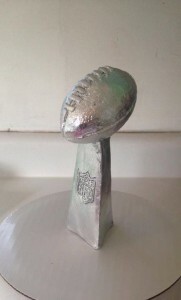 Modeling chocolate Lombardi trophy. Before the silver leaf that I have a love hate relationship with. After silver leaf… still needs some touching up. 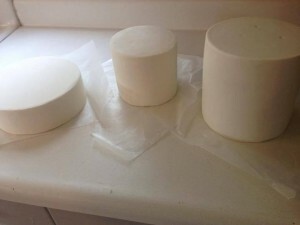 Three beautiful babies, covered in fondant, and ready to get Hawked out!!! 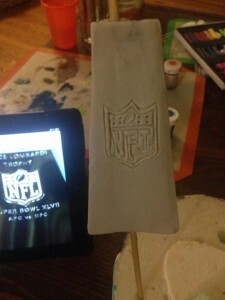 Getting ready to airbrush bottom tier. I airbrush for several reasons.. One, it’s way, way faster than dying the fondant all the way. Two, it uses significantly less food coloring. Three, I don’t have piles of leftover fondant in random colors I don’t need anymore. First coat of the field painted! 12th Man flag!!! Modeling chocolate, hand cut, and painted details. Beautiful work! 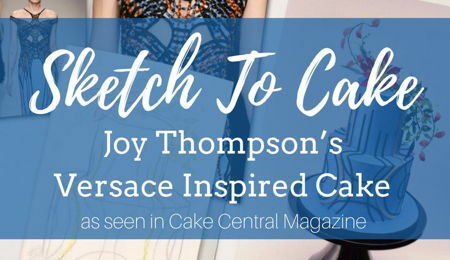 Thanks so much for sharing your step-by-step! I would love to paint on rice paper but am curios if you used food color gels mixed with vodka or if you used something else? Great work. They sale cocoa butter in different colors. I can't think of the website right now but they're suppose to be easy to paint with. Like real art, you silly woman this is real art! Yes, I use gel food coloring mixed with vodka primarily. Although I do use rice paper and wafer paper sometimes, this application is actually done with sugar paper. The kind you buy for an edible photo printer. Yes, I've seen coco butter used, but I guess I haven't really felt like trying it yet. Probably someday though! Hahaha, yes wildflower cakes ;). Sometimes when writing words on the internet, its easy for their context or intention to get lost. Everything in this post was taken from my Facebook page, where most people know a little more about me. 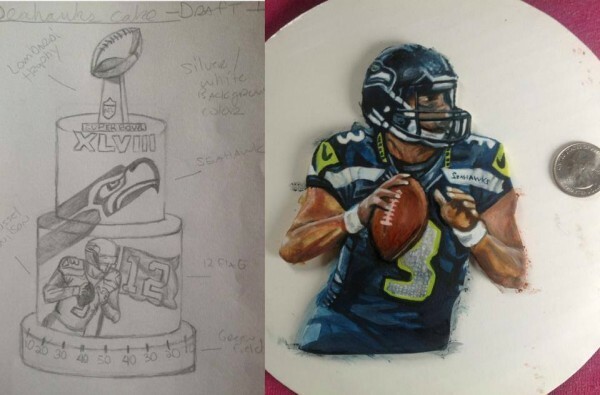 I started as a colored pencil portrait artist before I made cakes. 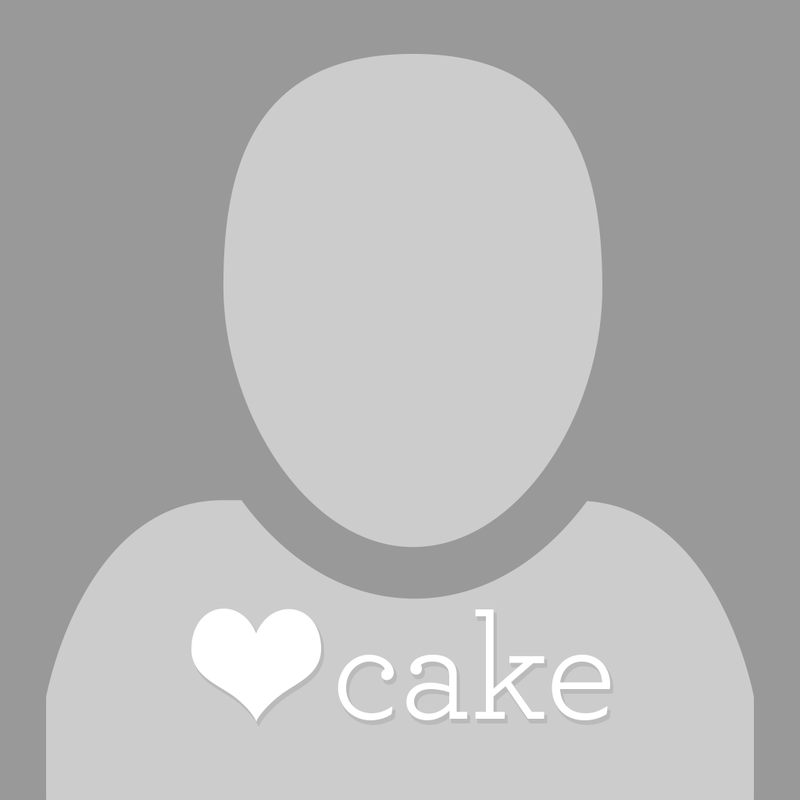 My intention is for my cake projects to feel as much like standard fine art applications as possible. 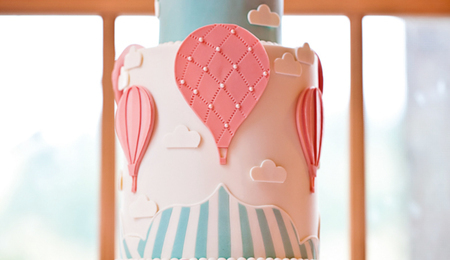 I know that cake design and decoration is an art form. I just try and find and create new ways of producing the things I make to feel the same as the art I was making before caking. Awesome job I live in Seattle great job.